The World Health Organization has published its weekly Situation Report on Zika, and its possible link to Microcephaly and Guillain-Barré Syndrome. The full PDF report runs 10 pages, I've only excepted the summary below. 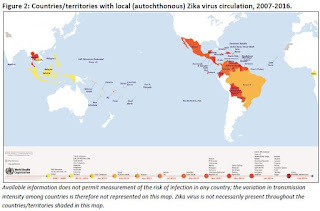 Between January 2007 and 17 February 2016, a total of 41 countries and territories reported local (autochthonous) transmission of Zika virus, including those where the outbreak is now over. One country (United States of America) reported a locally acquired case without vector-borne transmission, likely to have been contracted by sexual contact, and indirect evidence of local transmission has been documented in six additional countries. Two new countries/territories have reported local transmission in the week running up to 17 February 2016 (Aruba and Bonaire). Geographical distribution of Zika virus has steadily broadened since the virus was first detected in the Americas in 2015. Zika transmission has been reported in 28 countries/territories. The discovery of Zika virus in additional countries within the geographical range of competent mosquito vectors — especially Aedes aegypti— is considered likely. Evidence that neurological disorders, including microcephaly and GBS, are linked to Zika virus infection remains circumstantial, but a growing body of clinical and epidemiological data possibly leans towards a causal role for Zika virus. The global prevention and control strategy launched by WHO as a Strategic Response Framework (SRF) encompasses surveillance, response activities, and research. Following consultation with partners and taking changes in caseload into account, the SRF will be updated at the end of March 2016 to reflect epidemiological evidence coming to light and the evolving division of roles and responsibilities for tackling this emergency. From 2007 to 11 February 2016, Zika virus transmission was documented in a total of 48 countries/territories (Fig. 1 and Fig. 2). This includes 36 countries which reported local transmission between 2015 and 2016, six countries with indirect evidence of viral circulation, five countries with reported terminated outbreaks and one country with a locally acquired case but without vector-borne transmission (Table 1). Two new countries/territories – Aruba and Bonaire – reported autochthonous transmission in the week running up to 17 February 2016.